read this post in its entirety. For those of you out there who like to paint furniture, this post is for you! Want to get the most luxurious furniture finish that feels as smooth as glass? Well then, you need to visit a an auto parts supply store like AutoZone or Advanced Auto Parts and pick up some 400 and up grit auto body sandpaper (I love the 800 for a final polish.) This high grit sandpaper is the type that is used on the side of a corvette to make the fiberglass super smooth! (and did you know you can get sandpaper all the way up to 2200 or more grit?) Now, that is not necessary for what we are doing, but I thought it was interesting. High grit sandpaper is absolutely wonderful for using on your pieces painted with Chalk Paint™ Decorative Paint by Annie Sloan! The fine sandpaper makes them as smooth as glass! 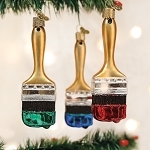 * Paint your piece with Chalk Paint™ Decorative Paint by Annie Sloan and let dry thoroughly. * Then gently polish the piece with the high grit sandpaper. Basically what you are doing is burnishing your paint. To burnish is defined as => to rub (a material) with a tool for compacting or smoothing. And that is what we are doing when polishing with fine sandpaper. We are knocking down any surface tension that existed from those micro small – can barely be seen by the naked eye – brush strokes. Something to be aware of – is if you burnish your Chalk Paint™ (we call this the Modern Look) that you may not be using Clear Wax on top. In fact- you may have a problem having the Clear Wax being absorbed into the Chalk Paint™ since by sanding the surface excessively to get that super smooth feel, you create a hard- compacted surface and the wax will have a hard time penetrating it or the Chalk Paint™ will have a difficult time absorbing the wax now. Slight sanding is fine!…I do this all the time and then apply Clear Wax. But if you are “polishing” the surface, please be aware of this caveat. After a couple of coats Chalk Paint™…a quick safe light dusting with a 220, 300 or 400 grit sandpaper and your finish will be super incredible. I like to do this on the top of a dresser or a table, but not always the whole piece just because sandpaper can get to be expensive and personally do not feel doing the whole piece is necessary. Then wax or not wax – it is up to you! Personally, I like to wax. 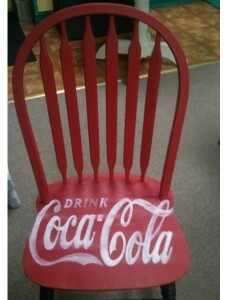 This is just one of the many tricks you can do with Annie Sloan Chalk Paint! Besides using a paint brush- try using a sponge kitchen cabinet roller and apply a few thin even coats of paint and then lightly sand. Sanding is best when there are a few applications of paint….not when there is a single layer. I also like to use sandpaper to get a worn aged effect when decorative painting. For instance, this Coca Cola chair that I painted for my shop (and no, this is not for sale – I painted it for myself to sit on – so don’t get crazy about copyright issues!) Anyway, when I painted the lettering I applied my paint and in some areas, the white paint was heavier (thicker) than in others. If I was using latex paint, this would have been a concern for me, but with using Chalk Paint™, I knew I could take my 200 grit sandpaper afterward, and strategically sand in a lateral direction, and sand down the high points of the paint. This gives a more uniformed “worn” effect and feels fantastic. Some people refer to this as a “distressed” look. I could have used a higher grit to polish the chair more- but the 220 sandpaper worked fine. Look at the photo and notice the horizontal worn sanding lines across the seat. Be strategic if you sand and not just go at it in a circular motion. I love Old Denim Jeans! Not just the feel – but the look of them! They are like “comfort food” after a long day of work. You come home and put them on- or on a weekend morning when you get dress….there is just something about the effect they have on you. 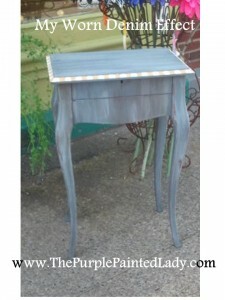 So, I played around when painting and recreated that worn denim look on this little table. I did all of this using Old Violet and made a glaze with Dark Wax (if you do not know how to do this- read my post here on my website called “Don’t Be Afraid Of The Dark”) and applied it and wiped off. Then once dried and cured for a few weeks- I sanded it with some 400 grit sandpaper and then clear waxed. The grey you see is where I sanded. What do you think? I suggest you experiment on your own with these techniques- especially since it is difficult to communicate all the details associated unless you can actually feel the difference yourself! Sort of like trying to describe the softness of a bed pillow. The best way to buy one- is to go to the store yourself and touch them. 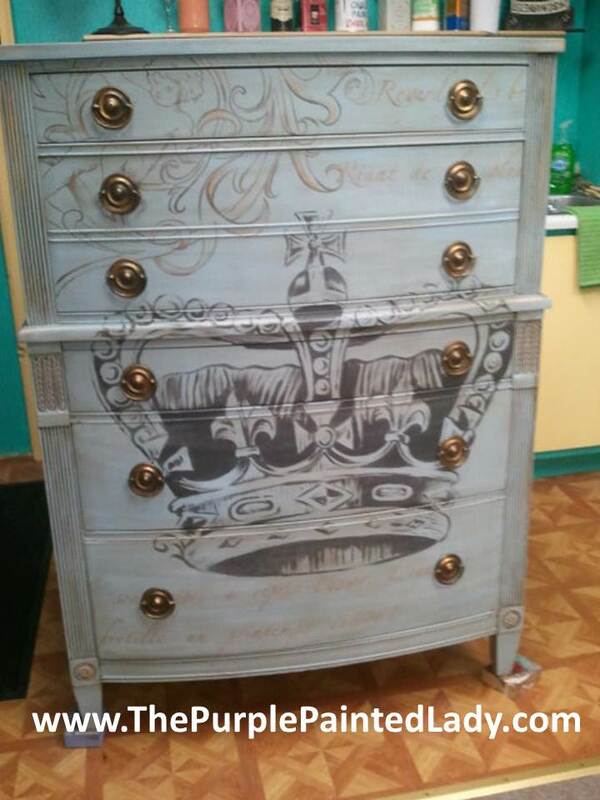 I also used the sandpaper to smooth out the front of the crown on this dresser painted with Louis Blue. 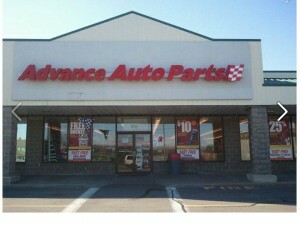 Now, if only I could get the jingle, “Get in the zone…Auto Zone” out of my head! The Purple Painted Lady Barn Sale 2012, baby!!!! I cannot even sleep without scheming! As I finally fell asleep on Monday night after a 6 hour drive home from meeting Annie Sloan in Boston (Oh yes I did! I met Annie and she is amazing!) However, with absolute no disrespect- first I need to share what was keeping me awake this time. As I was laying in bed exhausted, but yet totally inspired and psyched…I was thinking & scheming, and here I am now making this BIG announcement regarding …. are you wondering what it is? (I am guessing probably not based on the title of my post, right!) Well, I am sure you guessed it right! Another …..Purple Painted Lady Barn Sale! Date has yet to be confirmed – but it will most likely be a week or two after Labor Day. If you made it to The Purple Painted Lady Barn Sale last year and enjoyed it…..you are going to love this year even more. This sale is going to be even bigger and better!!!!! This will be a venue that you will not want to miss! I guarantee that! And if you paint furniture and buy your Annie Sloan Chalk Paint though me- get in touch if you would like to participate. Do I have a deal for you!!!!!! Stay tuned for details! Ok- now here I am – saving the ABSOLUTE best for last. I met Annie Sloan in person! Yep–you know the name on every quart of paint that you love to use! That is who I was honored to spend the day with. The first time I saw Annie was on Friday night for a brief few minutes. I felt embarrassed because I was star struck when I saw her. Just like a groupie for The Beatles. Right there in front of me was Annie! THE Annie Sloan. The woman who created a product that I not only love, but has literally changed my life and the altered the path I was on. What I adore most about Annie is her down to earth charm. Yes, she is brilliant! Yes, she created the one and only chalk paint over 20 years ago. Yes, she has written over 23 books. But the fact that this Rock Star in the design world is so sincerely gracious, kind and humble – well, it makes me adore her more and feel even more grateful to be part of her team….the Annie Sloan organization. I will post more about the Boston trip this week and share some of the highlights that Annie spoke about regarding her depth on colour combinations, direction and inspiration. But right now I would also like to write a bit about another fantastic woman who you may not know as much about. Her name is Lisa Rickert Jolie. It was Lisa who during her own home renovation/new build in Louisiana discovered Annie Sloan Chalk Paint and had it shipped here from England to use. She loved it so much that she approached Annie about distributing it in North America and well, the rest is history. To get an idea about how big this Annie Sloan Chalk Paint phenomenon is, just one year ago there were only about 10 US stockists and here we are a year later going on almost 200 stockist. 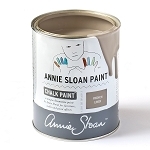 The incredible growth regarding Annie Sloan Chalk Paint had NOTHING to do with savvy marketing! It has all been due to the amazing qualities the paint has and word of mouth (and pen) by those who use it and then love it. As for Lisa (who is a power house of a business woman in a peanut size body.) Lisa has a very young family and I can only imagine the difficulties trying to balance her need and desire to be a wife and a mom with the corporate side of all of this. She is always available to field a phone call from one of her many stockists and is involved whenever we need her. I know she has had to sacrifice family time the last couple of years to help all of us achieve what we have. When I attempted to thank her in Boston- I got very choked up and had a difficult time not crying. Because as a mom- nothing is more important than your children. But from the outside looking in- I would say she is doing an incredible job. I know how much we (all stockists) appreciate everything that she does for us and the Annie Sloan brand! So Lisa, if by the slim chance you see this post….thank you very much for all that you have done to help so many women (and men) in the USA be able to do something that they love. I have worked in many places but have never been in a position to say 100% across the board- how grateful I am to be included in something so amazing and big! And when it comes to Annie Sloan and her Annie Sloan Chalk Paint and the Annie Sloan Unfolded organization (Jolie Design) – this is REALLY BIG! Cheers to Annie & Lisa!!!! Well, if you ever near my shop and have a moment – please stop in. I am always available to help you with design questions and of course- any questions you might have regarding Annie Sloan Chalk Paint. I will try to contain my enthusiasm and passion regarding Annie Sloan Chalk Paint as so to not take up too much of your time. But if you want to talk shop….than I am your girl!